Staten Island has a couple of tough situations. One is obvious and recent. The other is a complete lack of tourist revenue. In that regard, it is the forgotten borough. The good news is that pretty soon, the island will have a major tourist draw in the shape of a gigantic Ferris wheel along the lines of the London Eye, but bigger. The wheel will be a short walk from the ferry and will be accompanied by a retail mall. The only thing missing is a major sponsor, but not for lack of applicants. New York Wheel, LLC, which is behind the project, has had a short list since it started putting the program together, per David Taggart, the organization’s managing partner. He tells Marketing Daily that the timing of an announcement depends as much on the sponsor's timing. "We have lots of interest now, but the sponsor may decide to announce first." The organization, he says, is being selective in terms of naming rights: It has to be a national or global brand, with a family-friendly business. "We are talking to tech, auto, airline and finance sector brands, for example, that fit within our goals." And, he adds, it has to be a long-term commitment. "This is an icon that will be around for the long term and we want to marry that with [the sponsor/partner]." The 625-foot (about 60-stories) wheel, whose projected launch date is 2015, will be able to carry 1,440 people at a time in capsules that can each carry 40 people. One thing it won't carry is a big logo, per Taggart. Rather, opportunities for sponsorship assets include brand presence on the promenade leading up to the wheel, and on-grounds immersion experiences. "The engineers, architects, investors, and developers are very concerned about the wheel integrating physically with New York Harbor so we are not offering a billboard, but association with a first-class, unique destination -- an icon that will resonate locally and globally; and really, we don't think the right partner would be interested in a billboard-type presence." "There will be tremendous foot traffic at the wheel, so the sponsor gets the ability to get data from consumers, and brand immersions year-over-year," says Taggart, adding that other opportunties include "virtual traffic." "Individuals around the world will be exposed to the wheel [and the sponsoring brand] through social and traditional media. For the brand, those impressions are contextual." He adds that depending on who comes in, the sponsor may have specific assets in terms of co-branding on promotional materials. "Some are media entities in and of themselves so we will work with them on their branding." Richard Marin, president and CEO of New York Wheel, says there will be no problem getting tourists to Staten Island, as there are 55 million of them coming from around the world to New York and well over that from local traffic. "There are 10 million tourists who visit downtown and another 2 million who come on to Staten Island on the ferry," he said. "We are the third-largest attraction in New York." He added that there will, in fact, be opportunities for other brands to get involved. "That has to be figured out once we have an official sponsor." 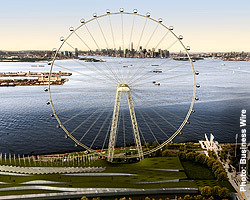 3 comments about "Who Will Sponsor Giant Staten Island Wheel? ". Mark Mills from Nationwide, November 16, 2012 at 9:09 a.m. But will it hold up in a hurricane? Karl Greenberg from MediaPost, November 16, 2012 at 9:59 a.m.
Seth Leeds from SPONSORIUM, November 16, 2012 at 11:18 a.m. It will be a must for the prospective sponsor to measure their objectives and criteria upfront.